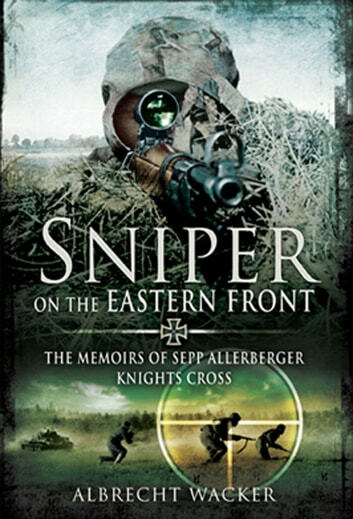 Josef “Sepp” Allerberger was the second most successful sniper of the German Wehrmacht and one of the few private soldiers to be honored with the award of the Knights Cross. An Austrian conscript, after qualifying as a machine gunner he was drafted to the southern sector of the Russian Front in July 1942. Wounded at Voroshilovsk, he experimented with a Russian sniper-rifle while convalescing and so impressed his superiors with his proficiency that he was returned to the front on his regiments only sniper specialist. In this sometimes harrowing memoir, Allerberger provides an excellent introduction to the commitment in field craft, discipline and routine required of the sniper, a man apart. There was no place for chivalry on the Russian Front. Away from the film cameras, no prisoner survived long after surrendering. Russian snipers had used the illegal explosive bullet since 1941, and Hitler eventually authorized its issue in 1944. The result was a battlefield of horror. Allerberger was a cold-blooded killer, but few will find a place in their hearts for the soldiers of the Red Army against whom he fought. The Eastern Front was a theatre of World War II where both sides had great villains pushing their people to destruction. Stalin was no lest a butcher than was Hitler but we tend to ignore this fact or to play it down. Albrecht Wacker was a young man thrown into a conflict that was not easy to understand, let alone survive in, and he managed to find a way to survive. This book, though brief, is an excellent account of a man doing the best that he can in the hell that is war. Throughout the book I kept asking myself what I would do if I found myself in similar circumstances. It's not an easy thing to do and this is not an easy book to read for that fact. Wacker is brief in his descriptions but the horror is still there. That said, it is an excellent book and I highly recommend it to anyone who is curious about the common soldier and the day to day chore of fighting in a war that callously chewed up so many lives. Excellent technical account of life as a sniper. Detached emotionally, filled with detail of the various duties of a WW2 sniper, humble and searching. Grisly details of various brutal acts, so buyer beware. Not for the feint of heart, but very informative and well written. Excellent. Unable to put down for long.